Health is not a goal. It is a journey. A workshop for yoga teachers who are interested in learning more hands-on adjustment techniques. This workshop is based on postures from ashtanga yoga. It is a great way to become more confident and knowledgeable on teaching your yoga classes less verbally and more with touch and subtle cues. Ayurveda has two goals: staying healthy and healing imbalance. What is Ayurveda? Ayurveda is a complete medical system from the same origins of yoga. It can heal or manage most all imbalances. Learn how preventative practice can dodge imbalances (diseases) throughout the aging process. Learn the Doshas – Vata Pitta Kapha Work with the fundamental energies in your body, mind, foods and lifestyle. The Importance of Digestion You aren’t what you eat, you are what you digest. How proper digestion is the foundation of health. Creating Balance Through Daily Routine When you sleep, eat, exercise, etc can have a profound effect on your life. Learn proper routines for health and happiness! I will be offering individual consultations February 1-3 at Transcend Yoga. These appointments are $95 and run 90 minutes. Ashtanga Vinyasa Yoga is a set sequence of postures that utilize movement linked with breath, creating heat to purify the mind and body. The Primary Series is the first sequence of postures, titled yoga cikitsa (yoga therapy). It is a beautiful set of postures that target the spine with forward folds, backbends and twists, lengthening and mobilizing the spine, to heal the entire body. This workshop will be taught traditionally with modifications offered to make all postures accessible to each student in the class. Breath is the backbone of the practice and each class is infused with ayurveda, sanskrit and vedic philosophies. Experience this traditional lineage of vinyasa yoga that was the precursor to power yoga! Enjoy a 3-hour ayurvedic conversation about how to practically use ayurveda for a healthy, happy life! What is health? Health is much more than absence of symptoms. It is a well-functioning body, a pleasant mind, accurate senses and a contented soul. Work with and balance the fundamental energies of the universe. You aren’t what you eat, you are what you digest. Discover how proper digestion is the foundation of health. There will be tips on how to balance the digestive fire for improving your health. Foods that aren’t properly digested get stored to be dealt with later. This sticky substance can clog and cause problems if digestion is not tended to. This is the main cause of disease. Learn more about ama and how to burn it away. Your schedule for sleeping, eating, exercising, etc can have a profound effect on your life. Learn how to schedule your day as well as some additional habits you may want to include. 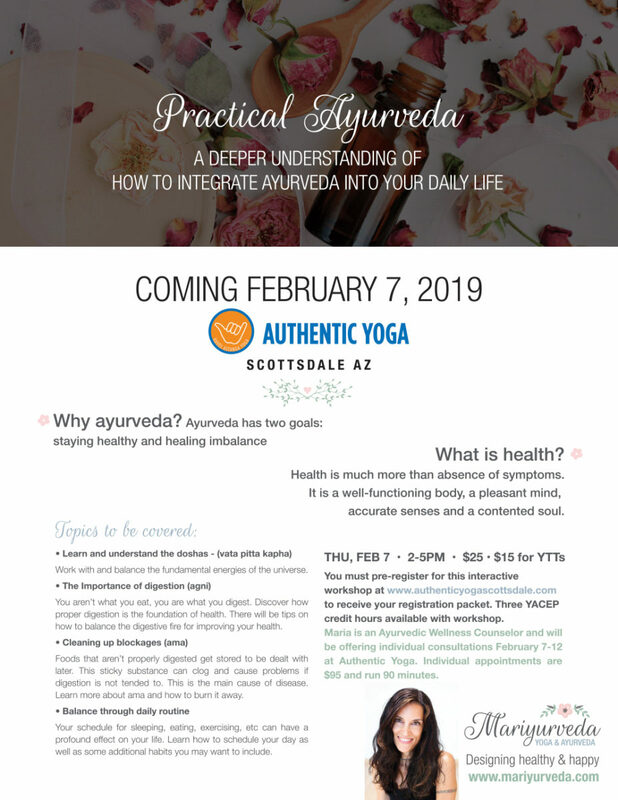 You will gain an amazing understanding of ayurveda through this workshop, and even if you already have basic knowledge, this will take you further in your understanding. I will also be offering individual consultations February 7-12 at Authentic Yoga. These appointments are $95 and run 90 minutes. Nowadays stress is a popular term for our minds, but in ayurveda stress is depletion in the mind or body from overuse. It is common for modern athletes to work hard, play hard, which takes a toll on reserves and resources. Goals keep getting more extreme and minds and bodies keep expanding to reach them. The problem, ayurvedically, is that without proper nourishment and rest, eventually things will get stressed, depleted and finally break down. Stress can show up in the form of intense training, not training…but still competing in a physical challenge, erratic training…or too much to do, heavy emotions, constantly pushing hard, fear and heavy expectations. In ayurveda we would never ask you to give up these amazing challenges you love to do! Instead, we want to offer you an individualized way to eat, schedule your day, practice and rest that will help you build your vitality, strength and energy reserves so that you can physically and mentally afford to conquer these goals. Join me for a 3-hour lecture on how to integrate ayurvedic routines and foods into your athletic lifestyle to become a stronger participant in your sports and in your life! My ghee and cooking party for November had to be rescheduled due to illness. It will now be held festively in December! I will do a demo on how to make your own ghee at home. I’m sure there will be some festive treats as well, along with mingling, sipping hot toddies and other holiday fun. There will be no gift exchanges or weird sweaters required. Unless you want to. Salt Lake Community College has announced their second annual SLCC Health and Fitness Conference. SLCC HLA department offers professional training for health and exercise specialists. My topic will be on ayurveda, mainly digestion and daily routine. We will also look at abhyanga and breath work. If you’re curious about the power of ayurveda, check it out! It’s a two day event and there will be food trucks for lunch. Their line-up of speakers is amazing, so check it out at: https://www.slcc.edu/hla/conference.aspx. Ayurveda has two goals: staying healthy and healing imbalance. 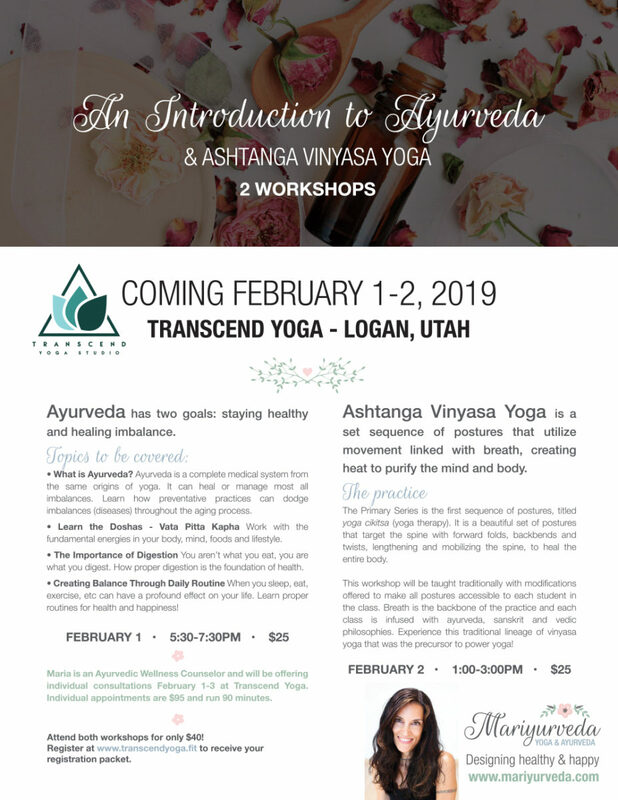 This workshop will introduce ayurvedic principles that can do both. What is Ayurveda? Ayurveda is a complete medical system from the same origins of yoga. It can heal or manage most all imbalances. Learn how preventative pratices can spare you from excess imbalances (diseases) throughout the aging process. Balancing the 20 Gunas Learn how to work with qualites of the universe that exist in food, environment, everything! Use cold to reduce hot, or oily to reduce dry. This is the foundation of treating and preventing imbalance. Learn the Doshas – Vata Pitta Kapha Work with the fundamental energies of the universe in your body, mind, foods and lifestyle. The Importance of Digestion You aren’t what you eat, you are what you digest. How proper digestion is the foundation of health in ayurveda. If you are passionate about health, nature and perhaps even yoga, this workshop is for you! Register online to receive your registration packet. Come to this fun interactive workshop to learn how to make ghee…at home! Ghee is an amazing alternative to most of the cooking oils we are used to using. It is great for nurturing vata, pacifies pitta (while still kindling the digestive fire) and is light enough for kapha. Once you know how to make ghee, you’ll be cooking with it all the time…it is one of the best oils to use! It also has a high cook temp so it doesn’t go bad like olive oil can. While waiting for the ghee to cook, we’ll throw together a nice batch of creamy homemade chai tea. Learn about some ayurvedic spices and how they can increase digestive fire…making this a great dessert for after meals. Once the ghee is done, we’ll drizzle it over some cinnamon apples, bake, and have a nice autumn treat! My goal is to create a nice community who loves to cook and use ayurveda. Please join us, meet others, and have some fun over the stove! Feel free to bring any homemade treats or fun beverages! Join special guest Yoga, Sanskrit, and Ayurveda teacher Maria Radloff and our 2018 Yoga Teacher Training crew for a very special Ayurveda workshop on Saturday, August 18th from 1pm – 5pm. This fascinating learning opportunity that will help you reach new levels of health is only a $25 per person! Maria will be introducing practical Ayurveda for use in every day life, as well as using it as an understanding of working with others. We will look at the 10 pairs of qualities, 3 doshas, 3 gunas, 6 tastes, agni/ama and dinacharya. We will look at where ayurveda comes from, including the 24 tattvas and how it connects to yoga. We will look at simple ways to balance things like dryness, heat, heaviness, and other qualities that can get easily get aggravated. We will spend time working on eating, food choices/menus, spices, daily routine, exercise, yoga practices, sleep, and how we can bring this all together in our already busy lives. Let’s take a look at daily routine and habitual patterns. Ayurveda brings us back to the natural rhythms of nature. Sometimes we may not realize that there are patterns in our life that could eventually lead to imbalance and disease. We will examine our daily lives and the things we do on a regular basis and see if we can reconstruct some of those things to lead us into health and balance…and vitality and happiness! Learn the language of yoga! To understand yoga, one needs to understand it’s language. Together we’ll learn the sounds of the alphabet so that no matter what Sanskrit word or phrase you see, you’ll be able to pronounce it correctly. Why is that important? Sanskrit is a vibrational language and the meaning is carried in the sound. If you enjoy chanting or learning about the philosophy of yoga, it is important to know the correct sounds. We will also do some chants in Sanskrit to practice using the sounds. Studying Sanskrit brightens the mind. Come feel the effects of this powerful language! Ayurveda Heals. Most everybody is suffering from imbalance…in ayurveda we look to see what is causing that imbalance, and then we try to eliminate it so it doesn’t continue coming back. There are many simple tips for lifestyle and diet that will offer you more balance, vitality, health and happiness! Learn where ayurveda comes from, how it works and how it can change your life! Ayurveda is a real science from India that trained doctors heal people with every day, sometimes miraculously! If you love yoga, you will LOVE ayurveda!